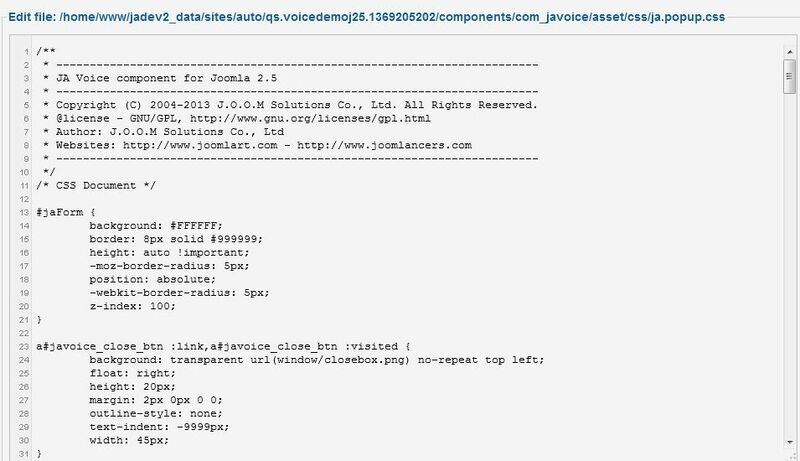 To access the component back-end, log in to your website back-end and click the JA User Voice in the Components menu, this will open JA Voice Administration Panel. 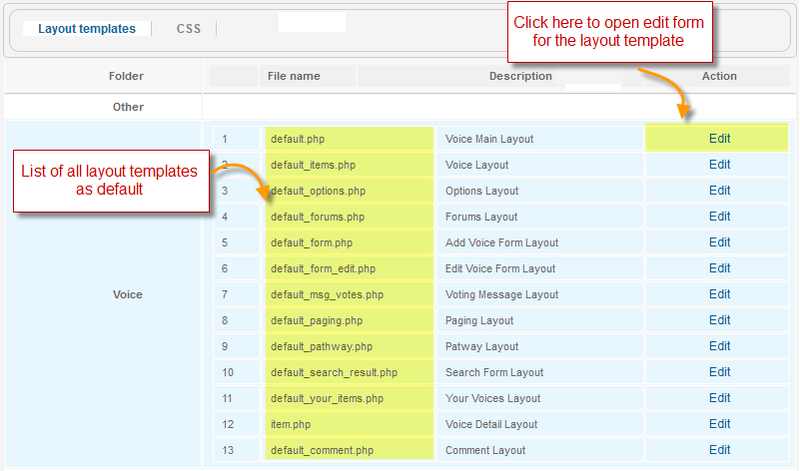 This is the navigation panel that will help you easily navigate to various JA Voice administration sections of the component. Each category on this panel will be referent on this page as a topic. Admin response is a short text of one voice that is written by administrators, and display bellow of the corresponding voice. Each voice has only one reply written by administrators. Forum is a place where you post voices to, like a section of voices. 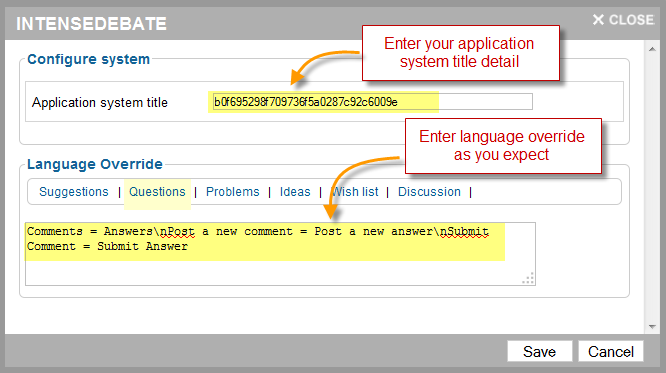 Comment system is a third party comment service that JA Voice uses for front-end user interaction. Voice is a voice type's item that user posts opinions, suggestions, questions, answers and other comments. 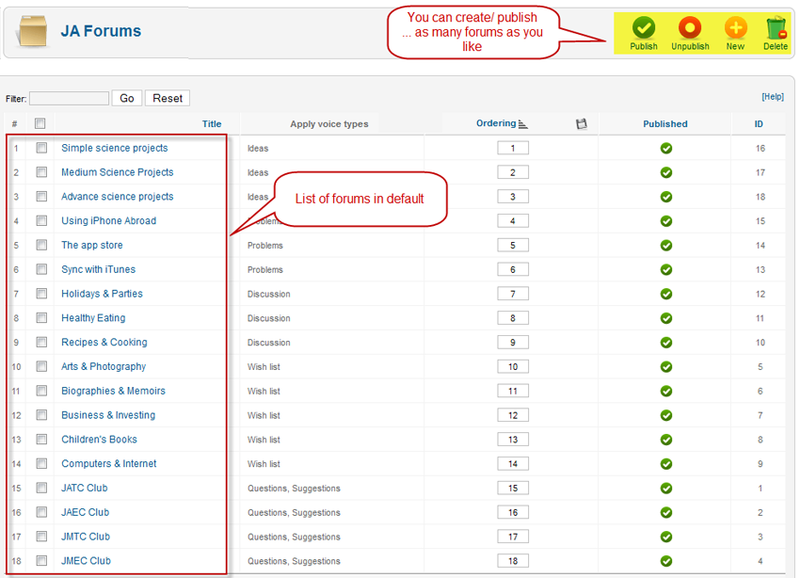 Moderator is registered user who can perform additional tasks in front-end depending on forum's settings. Usually he can moderate (edit, delete users' inputs) voices. Number of items statistics: The total numbers of each voice types by all time or by the last logged in time, you can easily view the new items of each types by click view link besides the numbers of new items. 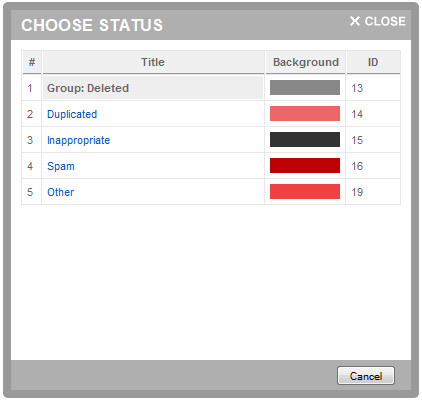 The latest spam updates: If the total numbers of reports on one item as spam or duplicate or inappropriate greater than or equal the total votes report spam setting on config category then that item will appear on this screen. You can easily view that item details by click on it. 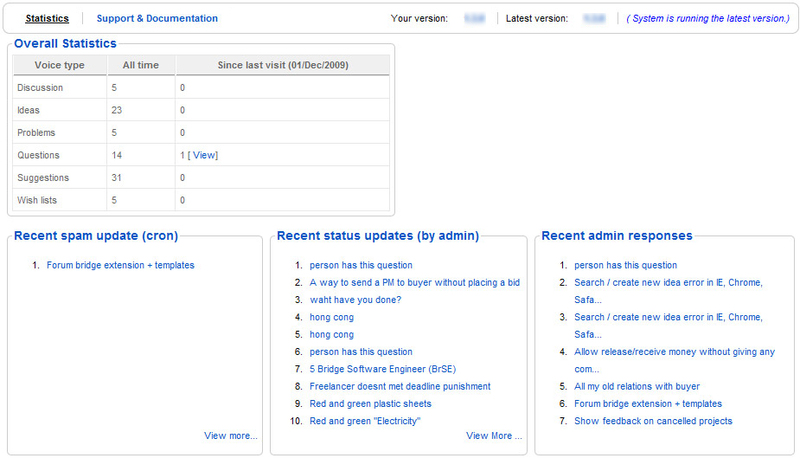 The latest status updates: If one item's status is changed, then it will appear on this list. You can click on one item to view its details. Latest admin responses: If moderators or administrators log in to front end, then these users can write a response for any items, the latest response will appear on this list. Voice Manager helps administrators manage all JA Voice's items. Items are grouped by voice types, from this list you can view some items's important information and perform some basic tasks like publish/ unpublish/ delete/ create new items, You can filter items of one voice type by name, by types, by forum, by status. You can also go to item's update page by click on its title. Each voice has information like the following. This administration section allows you to configure the settings for JA Voice. These settings affect the way JA Voice operates, manages JA Voice services and information that JA Voice displays in frontend for all users. special means that JA Voice is available only for administrators or moderators, an excellent way to customize the component without having to set entire website offline. Hide the JA Voice copyright - is used to enable or disable JA Voice copyright. Paging type - is used to set paging type: paging normal or paging scroll. Page to redirect - Page to redirect after posting a new Voice. Print - e-mail will be print on front-end instead of being sent, this option is used for debug purpose only. HTML/Plain text: Format of sending email setting: HTML or just plain text. From name: - Name of sender - overrides the From name in Joomla! global configuration. From e-mail: - Sender address - overrides the From e-mail in Joomla! global configuration. Cc e-mail: - E-mail addresses of people who also receive a copy of each e-mail sent by the system. 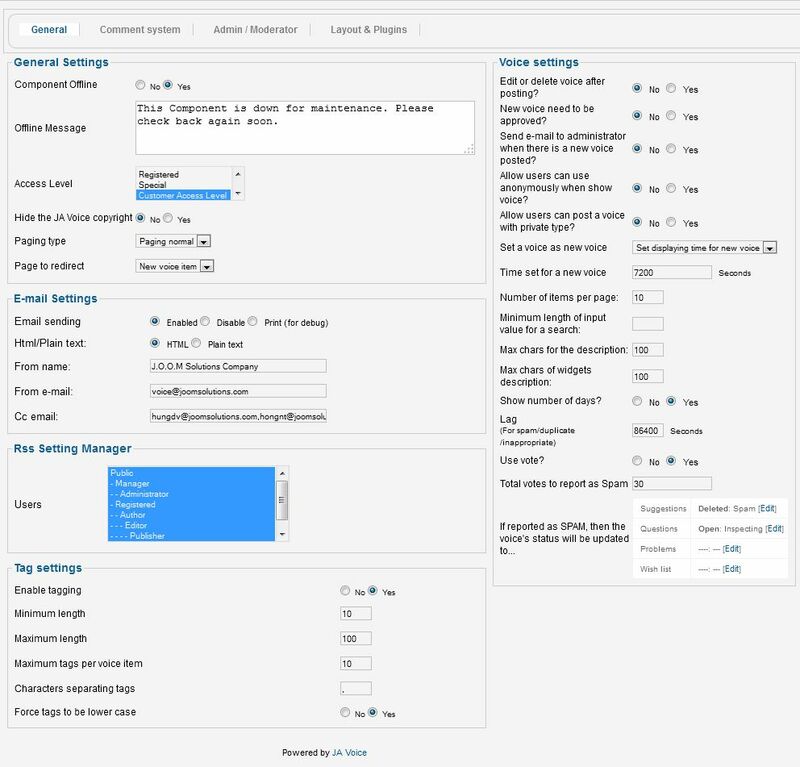 In this section you can set the access level for the RSS Settings Manager. The user group you set here will be able to configure RSS feeds according to their needs. Enabled Tagging This is global option to enable or disable the voice tagging system. Minimum length The minimum number of characters in a tag name. Maximum length The maximum number of characters in a tag name. Maximum tags per voice item The maximum total tags per thread. Characters separating tags If type in this option, a character will be displayed separate tags. Force tags to be lower case If you enable this option, A through Z will be replaced with a through z in tag names. Edit or delete voice after posting? - to define whether registered users can edit, delete voice. New voice need to be approved? - set here if you want new voices to be approved or not before being published. Allow users can use anonymously when show voice - allow user to use anonymously when show voice. Allow users can post a voice with private type? - allow user to create private voice, once the voice is set to private, only creator and admin can view it. Set a voice as new voice - to set a voice as new voice or latest login. Time set for a new voice - set time for new voice. Number of items per page - will split the multiple voices into several pages, according to a numbers of voices per page you can set here. Minimum length of input value for a search: - set the minimum length for the string (keywords) to search. Max Chars of Description: - length of voice's description in characters. Max chars of widgets description: - Maximum characters of widget's description to be shown in the homepage. Use value "-1" for unlimited and "0" to hide the description. Show number of days? - enabling this feature will inform users about how many days left since the voice was created. Lag: - if user report a voice as spam or duplicate or inappropriate then within this duration user cannot report again the same voice again. Use vote? - user can turn on/off vote function for voice item in front-end. Total votes to report as Spam - if the total numbers of reports of one voice is greater or equal this number, then this voice's status will automatically change to "Status is updated when report spam". Each forum has one or more voice types users can post. This administration section will allow you to publish,unpublish, create, update and delete voice types. You can delete a voice type only if it's not used by any voices. Votes quota: 100 - means users can vote 100 points for this voice type. 3 is for like very much. 3 is for "Highest priority". 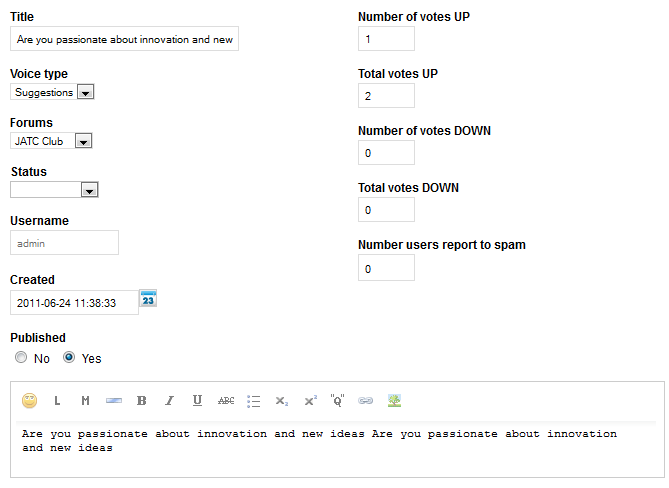 Ideas - similar to suggestions but having different vote settings. 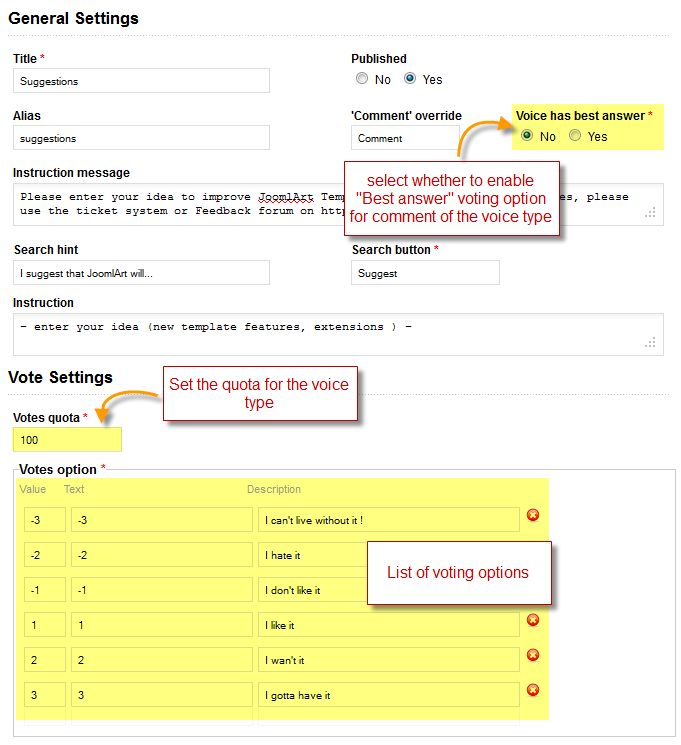 Note: You can enable the "Voice has best answer" option so that in front-end there will be "Best Answer" option voting in the comment/reply of all created voice for users to vote. Each voice type has their own set of processing statuses, these statuses are grouped into status group. The status of each voice is set by administrator or automatically when that voice is reported as spam or duplicate or inappropriate. Voice's status can be displayed beside voice's title on front-end depend on your setting. This page allows you to create/ update/ delete/ publish/ unpublish status or create/ delete/ update status's group. You can delete one status only if it's not used by any voices, before delete one status group, you must delete all that group's statuses. 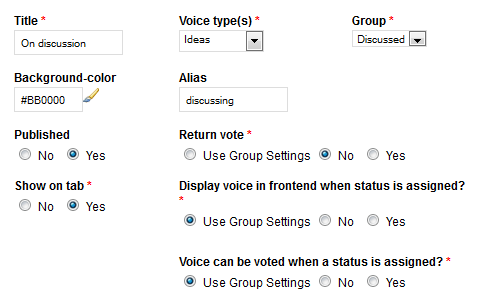 You can create status group or status only if you created voice types. Each status has information lịke the following. Forums are places that users post voice to. Customer can only post allowed voice types as specified in each forums, the default status of each voice depend on the predefined status setting for each voice type. Each forum has two types of permissions, post permission and view permission, which types of users each forum is available for post and view depend on these settings. This page allows you to publish/ unpublish/ create/ update/ delete forums. 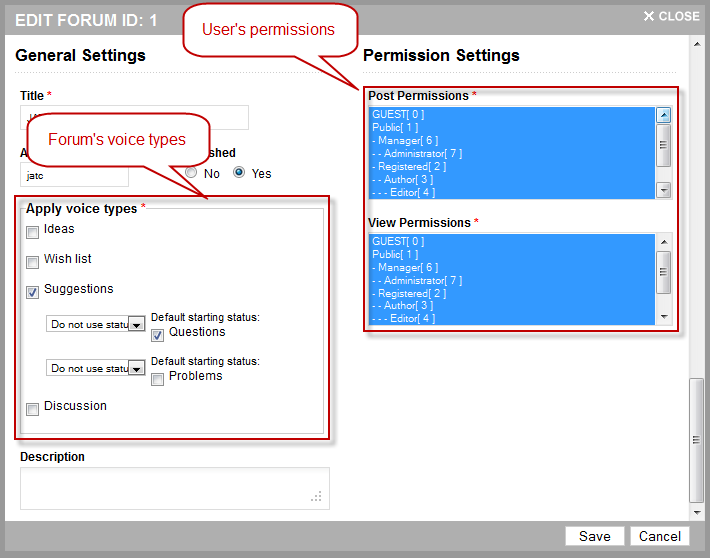 Note that you can create forum only if you created voice types. Each forums has information like the following. As you can see, for each forum you can set voice types to be used, set user access level, and also type in a description for the forum. In this section you can configure what comment system to use in JA Voice and also configure the integrate with these comment systems. JA Voice ingrates third party comment systems and also comment services such as IntenseDebate, Disqus. In order to use any of these comment systems, you have to register with it at its register page. Note that, if you switch comment system without import existing comments, then the existing comments will not be displayed. NEW JA Voice version 1.3.0 comes with JA Comment component integration. Also, JA Voice integrates JComment. Please note that comment systems highlighted with warning icon are not installed, and cannot be used as they are not yet present in your system setup. Here are the comment systems that can integrate with JA Voice. JA Voice integrates JA Comment and JComments with no code alteration needed or other additional settings. For each voice type you can also configure language overrides for various strings such as Comments renamed into Replies or Opinions, just as the image above exemplify. Registered users can log in to JA Voice's front-end and are able to post voices or reply to existing voices, moderators are also registered users that are added to JA Voice moderators can also log in to front-end to perform additional tasks depending on forum settings, JA Voice administrators are Joomla! administrators or super administrators that are added to JA Voice users. Joomla! 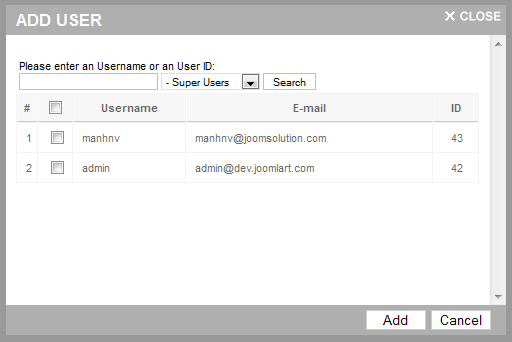 super administrator admin is the default JA Voice administrator, so you can not delete Joomla! super administrator from JA Voice users once added that user to JA Voice users. JA Voice administrator can do administrative tasks on JA Voice's back-end. You can add user to JA Voice users by clicking the Add user button, search users that you want to add, select them and then click the Add button in the pop-up. JA Voice allows you to configure several RSS feeds for your users to easily share with friends. You can add, delete, customize or even let your users configure feeds on their will if you grant them this privilege. Description - type in a description for the feed to be displayed under the Feed Title. type a number of days to set how old the voices must be, use 0 for all time. If you deselected a forum in the above config, but still want to display a specific voice, just type in here the ID value of this voice. If you want to include multiple voices, separate the ID values with a comma. You can also include voices created by specific creators. Same separate several values with a comma. In this administration section you can manage the tools used by the component for sharing and other frontend features. We will explain all features under the screenshot below. Display name - select to display username, real name or anonymous. RPXnow plugin: Twitter, Facebook and Google. Enable Pathway - uncheck this to stop displaying "Powered by JA Voice" footer in frontend view. Enable my items module - Show/hide The module My Items of the JA Voice component. Enable login form - set whether to enable or disable login form. Show a login form? - enable this option to show a login form for users to log in before posting. Integrate JA RPXnow - checking this option will integrate the RPXnow plugin that enables users to log in with several social networks account such as: OpenID, Wordpress, Google, Twitter and Facebook. Enable create new button - Show/hide The button Create New of the JA Voice component. AddThis - enables the AddThis social sharing button. Below you can paste the code supplied by the service provider. AddToAny Share Button - enables the AddToAny social sharing button. Below you can paste the code supplied by the service provider. After the Deadline - Spell check for Comments - enable this so users can check spelling into replies/comments after finished writing. Smileys - enables using emotion icons for users. You can also select the style of the smilies. YouTube Embeddable Video - check this to allow your users to post YouTube videos into comments/replies. Enable BBcode - check this to enable usage of BBCodes. JomSocial - Activity Stream - check this to enable displaying voices into JomSocial Activity Stream. Enable attach files in posted comments - check this to allow users to attach files into voices/replies. This feature is linked to general settings for allowed extensions. Enable captcha image security - check this to enable security images. Enable captcha for registered user - check this to enable security images for all user types. JA Voice can be enabled to send e-mail messages automatically, and uses e-mail templates to send several types of notifications. If your site is available in multiple languages, you can create e-mail templates in languages that are installed/available on your site. When sending an e-mail, JA Voice will use e-mail template in language of the sender if it's available, but if the template used by JA Voice is not available in sender's language, then the templates set in English will be used. You can publish/ unpublish/ create/ delete/ import/ export/ copy to/ update e-mail templates in this administration section. All these three cases along with Header and Footer templates need to be customized into your website's available languages. New languages are available if you install the language pack for Joomla! 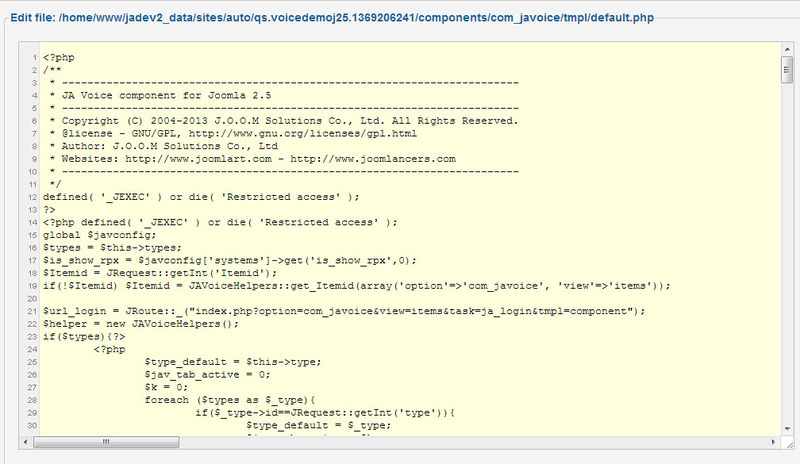 CMS, just like for the JA Voice component language customization. If you don't customize one of the template, but the corresponding English template is published, JA Comment will use the English template. 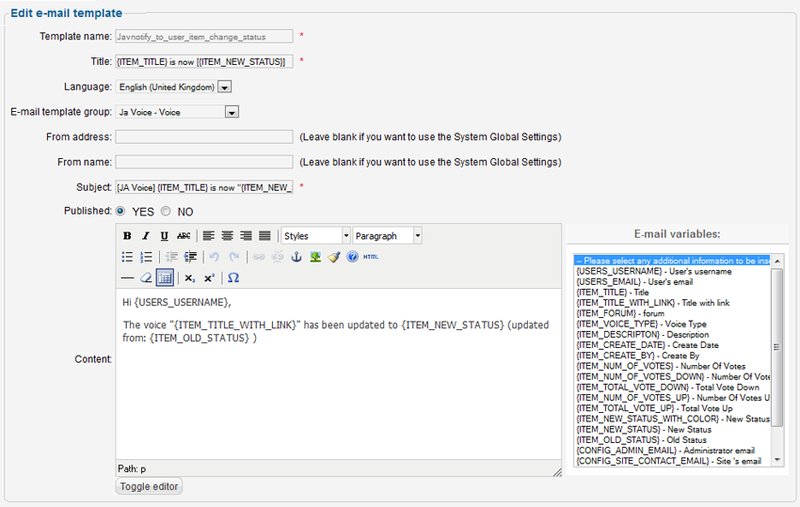 If you unpublish a template for all languages available in your website, JA Comment will not send e-mail for that case. JA Voice can be displayed in multiple language, to add another language, first you have to install new language in Joomla language manager. This category allows you to change language texts on front-end or back-end. Each text is displayed base on its key. 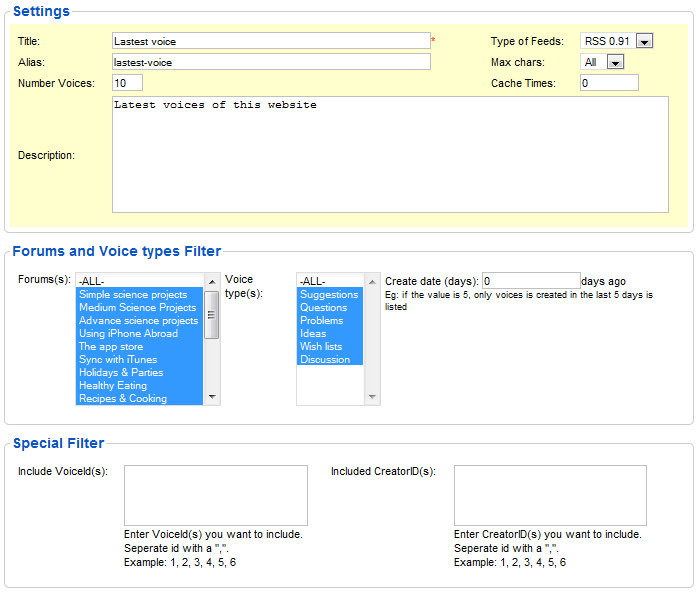 JA Voice component comes with a built in code editor to ease your work on design customization. This administration section allows you to customize front-end interface by editing template php and css files. For all of the files above you can create template overrides, so please visit our designated documentation section for more information. In the CSS tab of this administration section, click any of the CSS files to proceed with styling customizations. For all customizations made in this administration section, you have to back-up your website as the editors alter core files before any customization or upgrade process. This administration section displays license information of your website. Registering the component is an installation related procedure, so please refer to the designated documentation section. This page display links to support and documents page. If you feel you need assistance, feel free to ask support questions in our forum section. If you need professional help, our support team will assist you 24/7 in our support portal.